Frugal & Fabulous: Frugal & Fab - home of the $150 a month grocery budget! 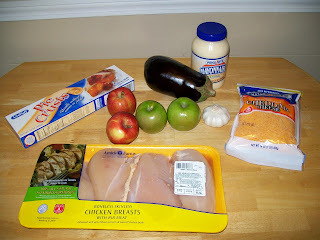 Frugal & Fab - home of the $150 a month grocery budget! I have decided to stick with my $150 a month grocery budget for 2009. (This is essentially $37.50 a week.) My budget includes all HBA & grocery purchases. I typically only spend $20-$28 a week on groceries for my husband, two cats and I. However, I wanted to give myself some extra wiggle room for stockpiling so that's why it's a little more. I'm lucky to live near a store with great discount produce - it's not always the best place to shop (crowded & long lines) but I almost always can get the lowest price around (without coupons)! 4 pounds of chicken - $6.66 ($1.69lb) cheaper than BIG Y or S&S this week!!! ha ha no worries on the posting!! I'm going to be pretty much MIA now that I'm working again.. until I can get into a new rythem! lol!